Jennifer Gonzales at Cult of Pedagogy wrote an excellent blog post yesterday Frickin' Packets that did a great job distinguishing between different kinds of worksheets teachers use from worksheets that are just busy work that she calls busysheets to worksheets that "directly support student learning" that she calls powersheets. Jennifer also writes about how sometimes the technology we use in class is really just a busysheet in disguise. One of the kinds of busysheets Jennifer rails against are word search puzzles. And naturally I thought "Hey I have a word search worksheet I made that is not a busysheet!" I'm not sure Jennifer would think its a powersheet but who knows. It's time to share it so I give you Stats Puzzle. Click through to download a full copy of Stats Puzzle to use in your classroom. I use this worksheet on the first day I am going to teach descriptive statistics. I think I collected the words initially from the IB SL syllabus but they are pretty standard words so this should work with whatever curriculum you are using. (I've used it for Non DP and even college intro stats courses too). I created this worksheet a while ago (I need to write on this blog more) and I think I made the initial word search using puzzlemaker.com. Here is how I run the lesson. 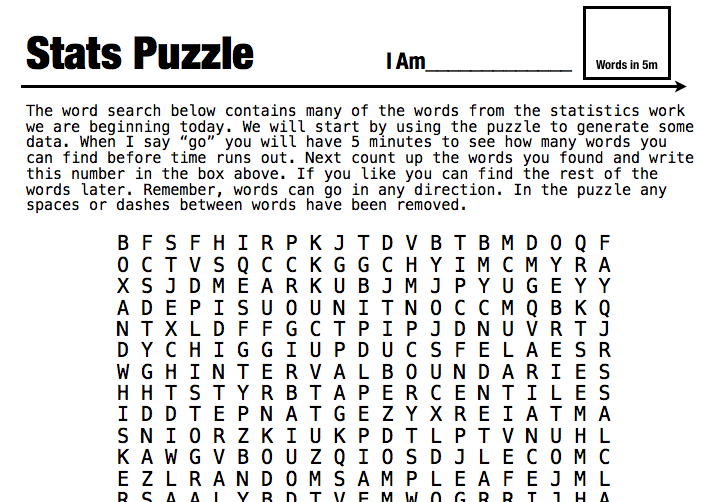 I give students five minutes to find as many stats words as they can in the word search. When time is up they tally the number of words that they were able to find. From here we collect each others data on the board and then I lead a discussion where I invite students to use the words from the word search to talk about the data we collected. We also define words as necessary. This always proves to be very fruitful, we are able to fill the board with charts and graphs and connect the vocabulary immediately with an activity they participated in. It also gives me a sense of which words the students already have a solid grasp of and which vocabulary they are less familiar with. It is also much more enjoyable than defining lots of terms by using the bland deck of power point slides provided with the textbook. If you are going to teach stats this year download this worksheet and give it a shot. if you'd like give me some feedback on Pinterest, Twitter, or share it with a friend, that would be awesome. 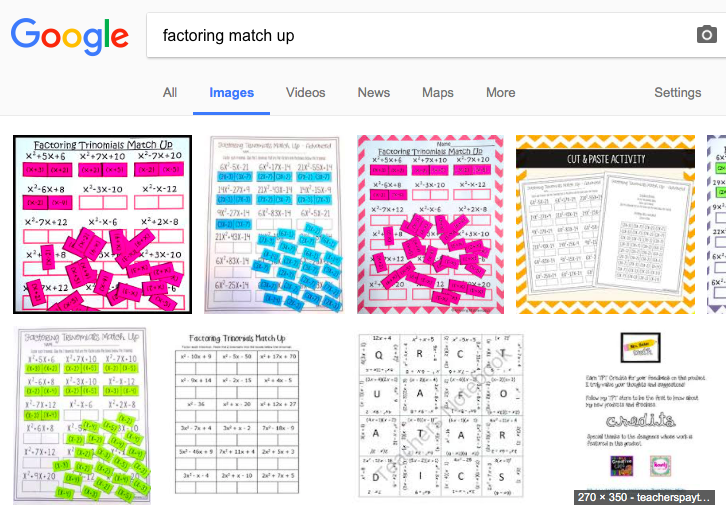 Two or three years ago I discovered a nifty factoring match up worksheet on Pinterest. I thought that it was pretty neat but I also wished it could be more of a puzzle. The brainstorming began. My mind drifted to two puzzle types that sometimes appear in Games Magazine. Analograms and A to Z. In A to Z there are 26 pictures and the reader has to label each one of them with one letter of the alphabet. This inevitably gets tricky –is that winter apparel a jacket, a coat, or maybe even a parka? In Analograms the reader has to supply the second half of an analogy using two words from a word bank, these also get very difficult in the same way as A to Z. In Factoring Puzzle in addition to matching up the factors (just like in the Factor Mix Up Worksheets) each factor is also assigned a word. So students need to make all the word pairs match up as well. To make the worksheet more of a puzzle I repeated factors and added decoy word pairs, for example DOG HOUSE and HOUSE CAT are two word pairs that make sense but only one of these is in the actual puzzle solution. 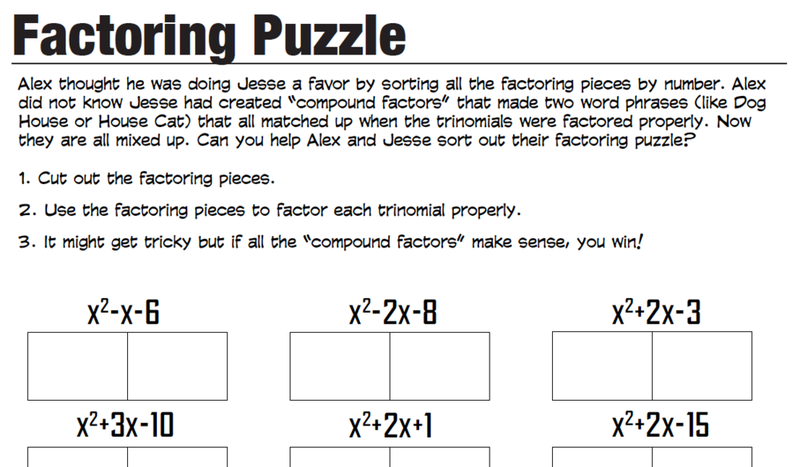 I hope this will be fun and engaging while also helping students practice their factoring! I purposely didn't copy the problems from the Factoring Mix Up worksheets while making this version so if there are any repeated problems this is purely coincidental. I am sure that students who are not good at factoring are going to approach the puzzle by multiplying out word pairs that they think are viable solutions and this is ok. When I notice students using this as their only strategy I will be able to intervene and give them targeted help. I think my Chinese students will also learn some additional two word phrases. Check out the puzzle below and download a copy if you want to try it out. Give me some feedback on Twitter or Pinterest if you'd like as well, that would be awesome. CLICK THROUGH TO DOWNLOAD A COPY, EDITABLE IN ILLUSTRATOR IF YOU HAVE IT. 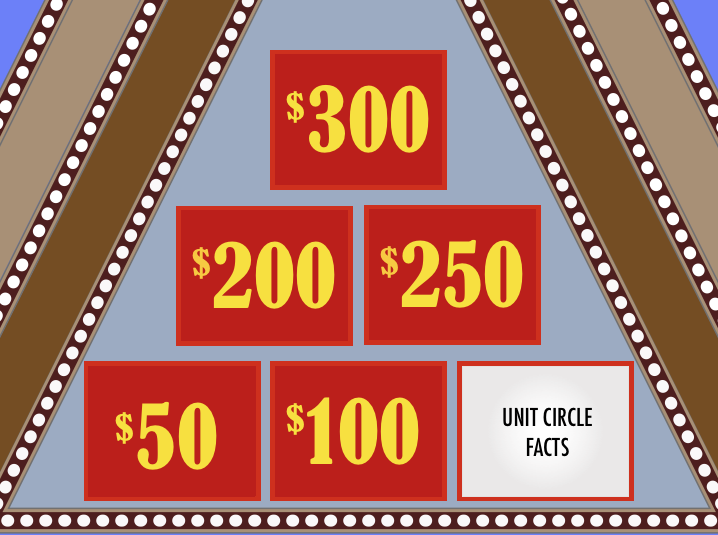 Finally, here is what the factoring pieces look like. One thing not posted here (and hopefully not anywhere else online anytime soon) is a key to this puzzle the kids can work that out for themselves! If you search for "Log Puzzle" in Google the first few hits are for a very clever packing puzzle with physical logs that I (of course) have a copy of in my too big puzzle collection. Anyhow, I've wanted to make a new math puzzle worksheet using basic logarithms for a while now and today was finally the day. (And yeah it took forever.) The initial idea was to make my own version of one of those maze worksheets but somehow I ended up with a design that is kind of a cross between dominoes and the iOS puzzle game Flow. I STARTED WITH A DRAFT ON GRAPH PAPER. I decided to make the puzzle bigger so next I drafted a larger version and planned out all the routes. (I am not going to share a picture of this since it would give away the solution to the puzzle.) Next, I created lots of basic equations with similar answers, trying to have many logs that would have positive, negative, and fractional answers. Finally, I created the whole thing in Illustrator and populated the puzzle with equations using Math Type. For some reason the parenthesis would not export out of Math Type into Illustrator so I had to screen shot these which is why some of the equations might look a little different. As I filled in the equations I tried to make the puzzle tricky by adding false routes, and grouping similar answers near each other. In case the puzzle is too tricky I made two versions of it, one where the ends of the snakes are revealed and one where they are not. You can download the puzzles below and give them a shot. Let me know on Twitter or Pinterest if you like them! As always I haven't posted the solution anywhere to keep them off Google for as long as possible. CLICK THROUGH FOR A PDF VERSION OF THE PUZZLE, IT'S EVEN EDITABLE IN ILLUSTRATOR IF YOU HAVE IT. Code Making and Breaking are a great hook for talking about functions, inverse functions, one-to-one functions etc. I've gotten great mileage out of this worksheet in every class I've used it, from honors to general track. Next week I am going to try it out with my students here in China. 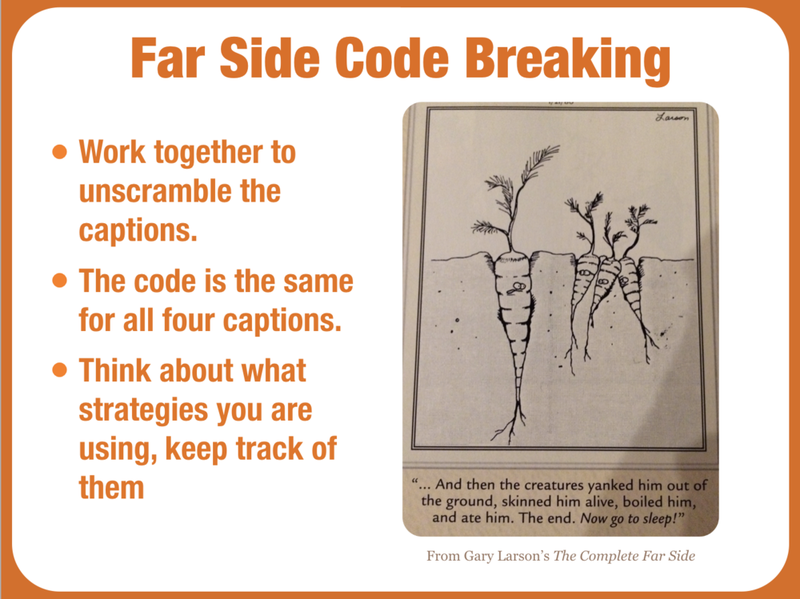 I encoded the captions to the four Far Side cartoons using a simple substitution cipher –like you would find in a newspaper cryptogram. I think the cartoons make the exercise more engaging. Click through to download this file as a PDF. Below is the slide I use to introduce the exercise. The carrot cartoon I chose is pretty dark but Larson's Far Side comic is often dark. (I don't think any of the captions or cartoons I chose for the worksheet are as dark.) Some students have actually never seen the Far Side before! Students usually initially think this task is impossible and usually let me know this. I am relentless, I encourage them to look for a "door-way" that will let them into the puzzle. The two most obvious entry points are in comics one and four. They feel really accomplished when they crack the codes. 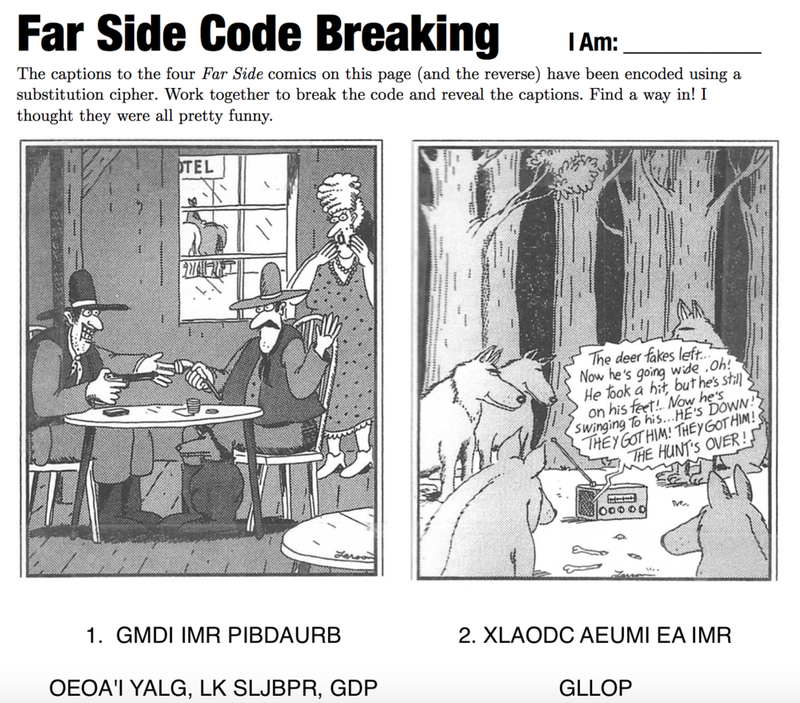 A nice extension activity for keen students is to have them find their own comic code it similarly. 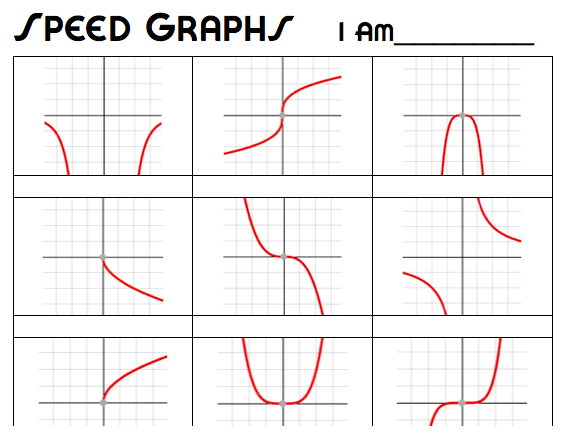 This is a quick graph matching worksheet I whipped up using Demos. All of the graphs have the same window. I want my students to get good at quickly identifying "parent graphs" so although this will be a "formative assessment" I will still time the quiz and score it but allow my students to do various versions of the worksheet to improve their scores as desired. If you open the file you will notice I have included two versions of the worksheet. They are subtly different. In class I will make sure that neighbors don't have the same version. If you search for "Trig Puzzle" in Google one of the first links is to this blog! Pretty neat since I don't update this enough, certainly not enough for my friend Rory. Anyhow, just before Christmas my PLC searched "Radical Puzzle" in Google a few times looking for a Tarsia style puzzle but couldn't find exactly what we wanted. Which was a Tarsia style puzzle that included simplifying radicals as well as basic radical operations (without variables). So we whipped one up that you can download as a PDF. Just click through the picture below. Click through to download this as a PDF file. The puzzle is a little tricky since there are problems on all 4 sides of the boxes, but the solution will read as expected. If you find the solution phrase too obnoxious you can always edit it in Acrobat. I haven't posted the solution anywhere to keep it off Google, although I know none of our students would ever search for such a thing. So for years I used Proof By Induction, but never really understood why it worked. This frustrated me, and so I set out to discover the «proof» for proof by induction. I searched far and wide in all my textbooks and just kept finding the domino analogy to justify the three steps. Sure the analogy is memorable, but to me it never seemed like a proof. So after looking up induction in nearly every book I have, I found a decent explanation in Paul Foerster's Precalculus. He uses Proof By Contradiction to develop induction and the method is both clear and logical. Unfortunately this great induction lesson has been relegated to an appendix, and there are no exercises at all (particularly unfortunate since Foerster's claim to fame is his problem sets). I used Paul's explanation to create a lesson, along with problems, and I have attached both below. I'm not teaching induction this year, but induction came up in a conversation I was having with my friend Bryan who is. The worksheet below is updated from the first time I taught this four or fives years ago. The last two times I taught induction, however, I turned the worksheet into HW problems to fit my Exeter style problem sets, these, and a whole strand of induction problems I used in subsequent problem sets are included here. Generally reinventing the wheel is not the way to go with a math activity but I am a glutton for punishment sometimes. Years ago teaching pre-algebra I had made students a handwritten puzzle worksheet in which to solve they had to cut out the pieces and reassemble them into a box making sure to align the sides using exponent rules. This, I think, might have been inspired by a similar Pizzazz worksheet. These ladies were on fire during this activity. Just outside my classroom are these awesome booths where students can work, love em. Anyhow, in one of my recent field trips through Sam's filing cabinet I remembered downloading something similar called a Tarsia puzzle. I would create one for my trigonometry students I figured. They had mastered the Unit Circle and I wanted to have them use the unit circle to have them think about some of the basic identities (odd, even, co-function etc.) I figured one of these puzzle worksheets could serve this purpose well. It might also be a nice bridge between the trig we had done so far and the next lesson I had originally planned about identities that I feared would be too hard. It turns out there is a free program to create these Tarsia puzzles (great resource here), but alas it is Windows only and at home I only have a Mac. Nevertheless the idea was gnawing at me so I decided to go for it and make my own. I found the PDF I had downloaded from Sam's site (I can't seem to find the exact link) and opened it in Illustrator. From here I was able to delete all the original equations and add new ones I created in Math Type. Before I entered any equations into Illustrator I made a list of the six identities I wanted to focus on and made eighteen pairs that students would have to match. Next I drew the final shape for my puzzles' picture on paper and entered the equations to create the key. From here it was relatively easy to create the student version of the worksheet because I just cut up my key and entered my triangles into Illustrator. It was initially challenging to get the text rotated and oriented properly but by the time I had entered a few triangles of data I was a pro. Additionally, I decided to add a couple layers to what was already a puzzle. First, I did not tell my students what final shape the triangles would be assembled into, and second I added a quote (that connects to the shape) that would reveal itself when the puzzle was completed. Further the quote has blanks that need to be filled in, making it even more challenging. I also figured that the blanks in the quote would make it more difficult for students to work the puzzle backwards. The quote also made it really easy to check to see if the puzzle was properly solved. I've used this activity with two of my three algebra two classes so far and it has gone great. It is a little bit more difficult than I intended but in one class one group was able to crack the whole thing during the time allotted but just barely. Another group stayed behind after class to finish it. During the lesson I moved from group to group and helped students make connections between the puzzle and the unit circle, great lesson for a Friday afternoon math class. Click through for a PDF version of the puzzle, editable in Illustrator if you have it. So I am now about a week in, to what has become a mild case of unit circle madness here at ASB. I got the grand idea of posting students completed unit circle worksheets on the wall with their times and blocks when they completed the task correctly in under 3:40. The length of «I Knew You Were Trouble.» I had told students to say «done» when they finished the task so that I could tell them their time to write on their paper. Of course, on the first day of this I wasn't even looking at the time when at 2:10 or so Camille shouts that she is done, and she was, correctly. Up to the wall she goes. And it's on. Everyone wants to be on the wall, and everyone on the wall wants to post a better time than they did previously. It's not unusual to spot kids practicing their unit circles at break and lunch. Completed Unit circles from C & E blocks. C block managed to have every student in the class successfully complete their challenge today! I encourage the students to compete against their personal bests and not against each other. But of course they do both. The fastest time I have ever ever seen goes to Malavika who has been killing it all week. 1:12 then 1:02 then 1:01 and yesterday an unbelievable 54 s. The entire class to a moment to gasp. But that was yesterday. Everyday is great new fun with the kids. This morning I was in my classroom losing a fight with the school printer when I realized I was about 6 copies short of the Unit Circle quiz sheets I would need for class (that was, of course, about to begin). «Oh, I might be able to help you with that Mr. Roy» says Ruby from a few feet away. «Huh? You have blank copies of the Trig Speed form? !» «I might» she says. «Well do you have 6?» Indeed she does! «I made some to practice.» I am of course laughing, because this is both awesome and ridiculous, a hallmark of ASB. And Ruby achieved a personal best when she finished her unit circle in 1:57. After my students measured the Unit Circle using the worksheet I adapted from Riley. We spent a class period or so figuring out all of the «nice» coordinates around the circle. A few kids vaguely (to my dismay but not surprise) remembered special right triangles, and so I made sure that we (mostly students at the board doing the heavy lifting) derived these from scratch. Once we filled in the coordinates all the way around the circle. I also introduced them to angle measure in radians and had the kids work in small groups to find all of these. This was fun because different groups were developing different strategies to figure out the angles and the room was buzzing with the discovery of new new strategies and approaches. Once we figured out all the angles we went through the entire diagram again from scratch and I asked the students to spend a few minutes seeing if they could figure out strategies to reproduce our unit circle quickly since next class we would have a quiz. The picture links to the PDF file. The first unit circle quiz day is always a good time because students come in and I ask them if there is a new pop song they want to hear and they inevitably choose something obnoxious and this works out perfectly. This year one of the girls chimed in and said «Just play anything by Taylor Swift!» I could not ask for more. «I Knew Your Were Trouble» it was. The quiz works simply, students keep the worksheet facedown until the song begins and need to finish it before the song ends. It turns out «I Knew Your Were Trouble» is 3:40 seconds. More than enough time for the unit circle. Maybe even two. Maybe you are thinking «Why do I torture the kids this way!» Haha. Well I am not out to torture them. I tell them straight up I am preparing them to be trig experts in the IB (that they will pursue next year) and that being able to quickly produce this unit circle will get them great results. Every year students come back from previous years to tell me how much it helped. And the students find it fun. 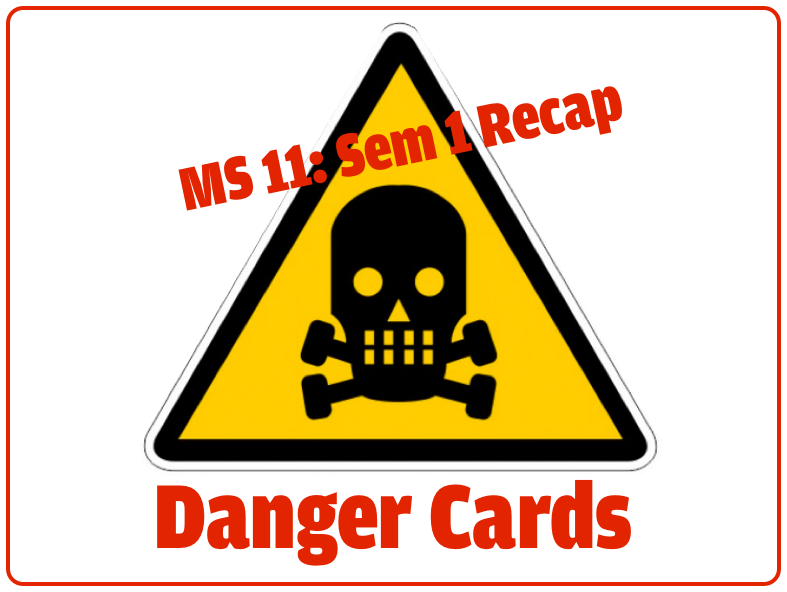 I do give the students a grade for the assignment, but not until the third time through (unless they think they finished it) and their low grades can be straight up replaced as students can finish the task. After each daily quiz I have students partner up with a peer to figure out errors and strategize, and then if necessary we work together as a class to clear up any class wide concerns. I encourage everyone to try to improve their score. If you are now thinking «Well why would you memorize anything? !» Then I suggest this great article from Wired back in 2008. I still, of course, haven't brought up the idea of cosine and sine, but students are more and more mentioning SOHCAHTOA and I am more and more insisting they must mean CAHSOHTOA. We started trig last week in Algebra 2. I began this time around with a trip online to see if I could find anything new to begin the unit with. 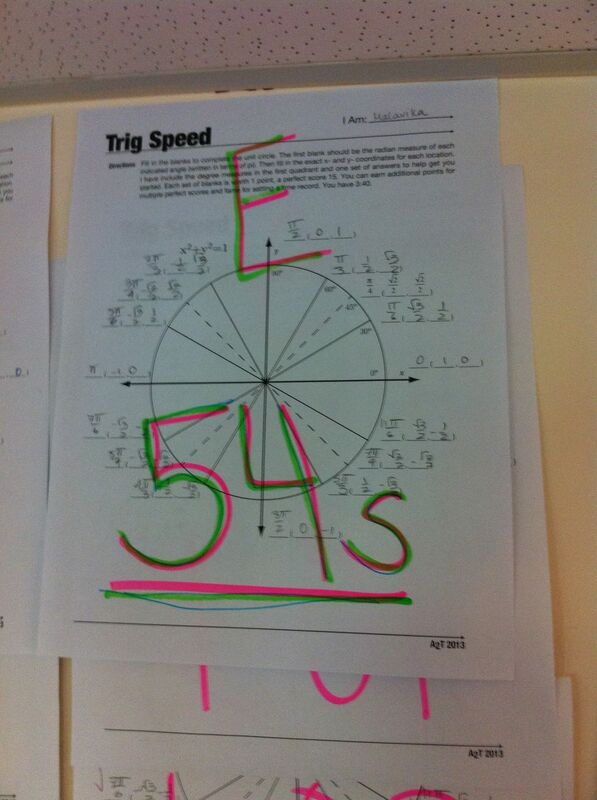 I found this great post by Riley (via Sam Shah) about having kids measure the Unit Circle. A kind of sandbox approach. Anyhow it worked fantastically. In all three of my classes we were able to have great discussions about all the stuff that was learned by measuring this all out by hand. And I don't think anyone even asked «But Roy, when are we ever gonna use this?» In one of my classes the students got into a little debate reminiscent of Name That Tune's bid a note as they tried to lower the number of measurements that were actually needed to label all the points on the circle. I was sure they would figure out the various quadrants, but when they made the connections to the complementary angles within the quadrants I knew for sure this was the perfect activity to begin trig with. First half of the first half of the worksheet. Incidentally I took Riley's picture and turned it into a worksheet. Here is the file. I began class by having my students type their data into a Google Spreadsheet that I set up with them to calculate the mean of their scores. I plan on going back to this spreadsheet in the next couple of days and adding a cosine and sine value to it. First half of the second half of the worksheet. Hey, I'm a math teacher in Mumbai, India. I spent last year as the technology coordinator but this year I am heading back into the classroom. Blogging everyday is tough, so far I am failing, badly. Check out this Review Game.